Cyber operations are a challenging mission for the U.S. Defense Department and government community that builds, operates and defends networks. Cyber leaders and warriors must continually evolve to adapt to future innovations and develop and leverage cutting-edge tools and technologies. Participants will discuss requirements and solutions to ensure that the networks within DoD are adaptive, resilient and effective across a range of uses and against diverse threats. 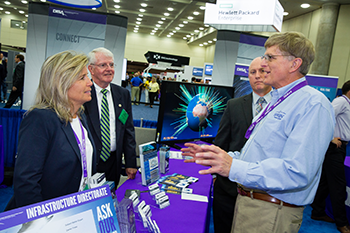 Leveraging innovative technology, advancing cybersecurity and building new relationships are topics experts will examine in depth May 15-17 at the Baltimore Convention Center in Maryland. Cyber operations are a challenging mission for the U.S. Defense Department and government community that builds, operates and defends networks. Attendees include members of the Defense Information Systems Agency, Joint Force Headquarters-DoD Information Network and DoD Chief Information Office as well as a mix of service cyber components, agencies, industry, academia and the military services. Discussions will focus on leveraging innovative technology, advancing cybersecurity and building new relationships between the military and industry sectors. When/where does the symposium take place? The event takes place May 15-17, 2018, at the Baltimore Convention Center in Maryland. More information is available online. The exhibit hall opens at 1:15 p.m. on May 15 and closes at 1:30 p.m. on May 17. A current list of exhibitors and the exhibit hall floor plan are available online. Rates vary depending on military/government and AFCEA membership status. Check the registration fees page for specific information. All badges must be picked up on site at the registration desk. All registrants will receive a confirmation notice via email. If you do not receive a confirmation, please contact the DCOS Registration Center at (703) 631-6200 cyberopsregistration@jspargo.com. Information about parking garages located near the convention center is available online. All Defensive Cyber Operations Symposium events are business attire. Military personnel are encouraged to wear the appropriate uniform of the day. View the DISA HQ 2018 DCOS Bus Schedule. AFCEA supports the Americans with Disabilities Act of 1990. Attendees with special needs should call (703) 631-6238 or email events@afcea.org. Attendees are not permitted to photograph, record or videotape any portion of the Defensive Cyber Operations Symposium proceedings. Working members of the press are required to check in at the press desk at registration to photograph and/or videotape at the show. Attendees understand that AFCEA and their authorized representatives (show management) may conduct interviews and may take photographs and/or videotape in any part of the conference and exhibit hall. These photographs, videos and recordings are for use by show management in publications or other media material produced for the purposes of conference promotion, including but not limited to: brochures, invitations, books, newspapers, magazines, television and websites. Attendee and exhibitor registration grants show management permission and consent for use of this photography and video. How can I exhibit at and/or sponsor? Exhibit and sponsorship information, current list of exhibitors and the exhibit hall floor plan are available online. Check out the Exhibitor and Sponsor FAQs where you’ll find the Exhibitor Service Manual, exhibitor housing information, a deadline checklist and numerous additional tools to get the most out of your ensure your exhibiting experience.